If you’re into lifted 4×4 trucks, you know what a pain getting your truck up in the air can be since they have such high ground clearance. 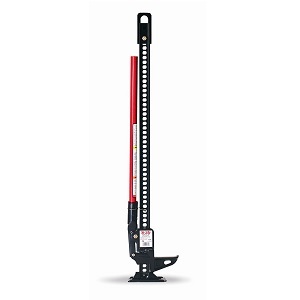 At maximum height, many ordinary floor jacks don’t reach high enough to engage the chassis of some lifted vehicles. Even more of a challenge is when your truck is too tall for SUV jacks to reach. Fortunately, there is a type of floor jack designed specifically for lifted vehicles that you can take advantage of. Whether you wrench in your garage or spend time 4-wheeling on backcountry fire roads, you are likely to rely heavily on a jack specifically designed to lift your rig. The best jacks for lifted trucks tend to have a high maximum height, durable construction, and portability so they can be stored in/on your truck. To help speed your search, we’ve taken some time to provide a recommendation for our favorite. Hi-Lift offers three main sizes for their off-road jack, a 36-inch, a 42-inch, and a 60-inch version. You probably are already familiar with this style of jack as these are the same jacks that you have seen attached to military Jeeps throughout the different generations. In fact, the military still uses floor jacks like these today. Each jack is made with a mixture of cast and stamped components to offer high-strength and durability while minimizing the cost. The jacks feature a top winch connector clamp at the end of the jack shaft and the jack shaft is powder coated in black for a long lasting anti-corrosion finish. The handle is powder coated in red, and all hardware is zinc-plated for additional corrosion protection. If you 4-wheel with your jack, the corrosion resistance is imperative due to the high likelihood that your jack will be exposed to the elements. Each version of the jack can be used for pushing, pulling, winching, and clamping, as well as lifting your vehicle depending on placement. Each jack has a rated load capacity of 4,660 pounds. Safe use information stickers are placed on the handle which detail rated loading options and operating instructions. Much like an ordinary floor jack, each Hi-Lift jack is actuated by pumping the handle. With each stroke, a ratcheting mechanism will walk the carrier up the main beam, slowly elevating the platform that contains the jack pad. The design is incredibly simplistic, which makes it highly reliable. Perhaps this is the reason that Hi-Lift jacks have been outfitted on everything from safari vehicles to Humvees. As far as available purchasing options, Amazon’s economical pricing makes it the place we’d start our hunt for a new Hi-Lift jack for your lifted truck. Overall, we think you’ll be very pleased with the Hi-Lift jack and as such, we give it a strong recommendation. Happy wrenching!